Chinese smartphone maker Xiaomi recently introduced two new Android smartphones – Mi Mix 2 and the Mi Note 3. However, it is only the Mi Mix 2 that runs on the flagship Snapdragon 835 chipset. The new Mi Note 3 is powered by a mid-range Snapdragon 660 chipset instead. According to a new benchmark listing on GFXBench, the company might introduce a new device with the Snapdragon 835 chipset very soon. Listed on GFXBench as “Chiron”, the device seems to be a bigger version of the Mi 6 as far as the spec-sheet goes. The Xiaomi ‘Chiron’ is listed to feature a 5.6-inch sized display with 1080 x 1980 resolution display, which is definitely a bit odd. That said, it still makes for a 16:9 aspect ratio, so it does seem pretty clear that the device will not boast a ‘bezel-less’ front design like the Mi Mix 2. The smartphone will be powered by Qualcomm’s Snapdragon 835 64-bit octa-core chipset, which should make it the third Xiaomi smartphone to run on the flagship SoC after the Mi 6 and the Mi Mix 2. 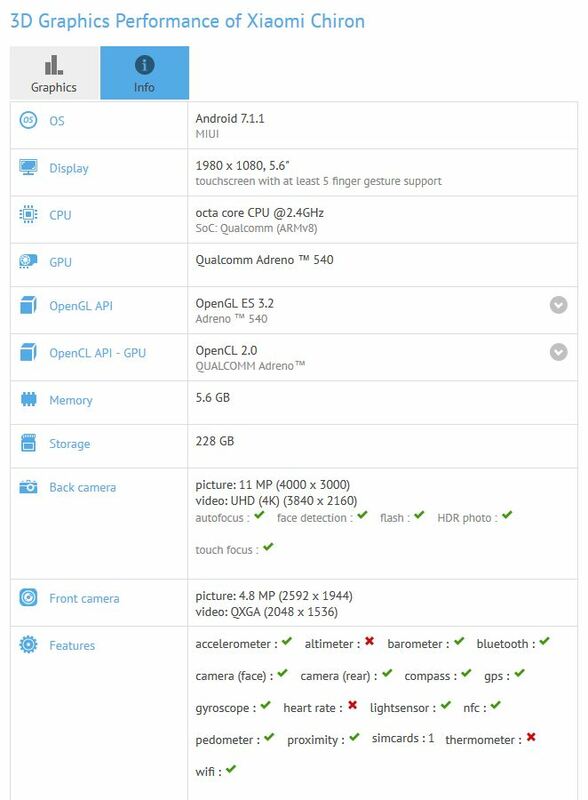 The octa-core chipset will be paired with 6GB of RAM and 256GB of onboard storage. It is likely that Xiaomi will offer a more affordable variant as well, packing lower internal storage and perhaps a lower amount of RAM as well. At the back, the benchmark listing suggests the handset will come with a 12MP resolution rear camera capable of shooting videos at up to 4K Ultra HD resolution. For selfies, the smartphone will come with a 5MP resolution snapper on the front. In terms of software, the smartphone will be running on Android 7.1 Nougat operating system out of the box with Xiaomi’s MIUI 9 running on top. Since the benchmark listing doesn’t give us any clue, it is tough to guess the actual name of the device. That leaves us with only one option – to wait and watch for more leaks. What are your thoughts on the Xiaomi ‘Chiron’? Do you think it could be the Mi Note 3 that some fans were actually looking forward to?